Railway Maps from Omnimap, the leading international map store with 275,000 map titles. Professional Railroad Atlas of North America. DeskMap Systems, Inc. 4th edition, 2012. The new edition has been expanded to include all recent mergers, mileages, intermodal and port sites, and additional inset maps. 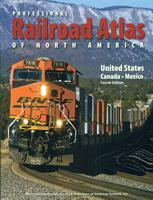 It is the only rail atlas showing the United States, Canada, and Mexico in a single atlas. 112 pages. 96 pages covering all rail in the US, Canada, and Mexico. Contains a two-page, full-color US Rail Map. Major rail lines are color coded. Reporting marks on all rail lines. Contact information for US, Canadian, and Mexican railroads. Thousands of stations are displayed. Eastern USA Rail Museums & Trips map. Bella Terra. Information on 334 rail attractions from Maine to Florida--the most comprehensive and up-to-date listing anywhere! Includes railroad museums & exhibits, historic depots, scenic railroads, dinner trains, trolley rides & museums, miniature railroads, model layouts & antique toy trains, railroad historic sites, and train viewing platforms. Covers every state along the Atlantic coast plus Vermont, Pennsylvania & West Virginia. Locations shown on detailed maps--including 5 insets--for easy travel planning. GPS addresses in directory. 16 eye-catching, original watercolor illustrations. $9.95 62-20983E 1 sheet, folded. Central USA Rail Museums & Trips map. Bella Terra. Information on 429 rail attractions, from the Great Lakes to the Gulf Coast–the most comprehensive and up-to-date listing anywhere! Includes railroad museums & exhibits, historic depots, scenic railroads, dinner trains, trolley rides & museums, miniature railroads, model layouts & antique toy trains, railroad historic sites, and train-watching sites. Locations shown on detailed maps–including 6 insets–for easy travel planning. GPS addresses in directory. $9.95 62-20983C 1 sheet, folded. Western USA Rail Museums & Trips map. Bella Terra. Comprehensive & up-to-date information on 445 rail attractions in 19 states, from the Great Plains and Texas to the Pacific. Locations shown on detailed maps—including 7 insets—for easy travel planning. GPS addresses in directory. $9.95 62-20983W 1 sheet, folded. USA Rail Museums & Trips map set. Bella Terra. 3-sheet map set covers more than 1,200 rail attractions across the entire country—the most comprehensive and up-to-date listing anywhere! Locations are shown on detailed maps for easy travel planning. Text includes descriptions, physical locations, contact info and symbols for 8 categories of attractions. Each map has 16 eye-catching, original watercolor illustrations. $24.95 62-20983S 3 sheet set, folded. Railroads of the Continental United States. Deskmap Systems. This map is the industry standard railroad map and is currently used by thousands of transportation professionals. The complete US rail system as well as southern Canada and northern Mexico are displayed on this 36" x 48" map. Printed in full colors, the highly detailed map shows more than 7,000 cities, towns, and station points. Reporting marks on the map are indexed for more than 650 railroad companies to identify operations. Intermodal hubs and interchange points are clearly represented. Available only as laminated flat (rolled) map. Size is 36 x 48"
$69.99 62-20905L 1 sheet, laminated. Texas Railroad Systems Map. DeskMap Systems, Inc. This 36" x 39" Texas Railroad Systems Map shows all rail lines in Texas. The full-color map has five insets showing rail detail of Dallas-Ft. Worth, Houston, Beaumont, El Paso, and San Antonio. The map displays interstate and major highways, counties and water detail. 36 x 39". $84.95 62-95905 1 sheet, flat. $119.95 62-95905L 1 sheet, laminated.